The sewcialist community seems to be divided on the two-timing thing. Some folks love developing relationships with many projects at once, while some are absolutely faithful and may as well be wearing blinders. For most of my sewing life, I’ve been a one-plan woman. Getting started can be the hardest part for me, so when that’s done, I pretty much plow through to the end. Those things in my drawers that I call Unfinished Objects (UFOs) are, in truth, Will Never Be Finished Objects (WNBFOs). If I’ve become so perturbed with something that it gets put away, it is likely that it will languish there until I throw/give it away or reuse the fabric for something else. Very few exceptions. But lately, in the past month or two, I’ve been flirting with the other side. I started doing it without consciously deciding to, but in retrospect there are several justifications for it. 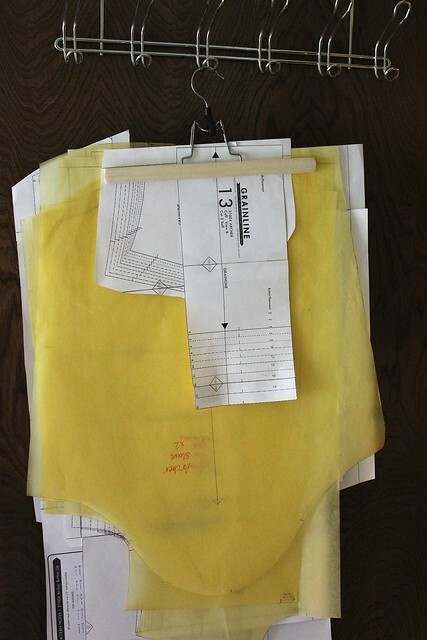 The biggest one is that I have favorite and unfavorite parts of the sewing process. For example, I dig the pattern alteration and actual stitching/construction parts. I typically do not enjoy cutting out the fabric or fusing the interfacing. I’ve noticed that if my next step is a part I am dreading, sometimes it will keep me out of my studio for days. During that time, I’m not getting my sewing fix, which… isn’t pretty. On the other hand, there are times when I feel up to these things, and I can capitalize on it when that happens. Plus, sometimes a project needs to marinate, either literally or figuratively. There are the times, for instance, when a garment needs to hang for a while before hemming. But even more common for me is when I’m stuck on something and can’t figure it out — often walking away is the best plan. Maybe I only need a ten-minute break, but maybe I need a few days. Sometimes I even dream the solution, for realz. Want another reason? Other timing things can make an impact, like this one: I’m participating in the Archer Sew Along. This is my first time making a shirt like this, so I think it will be good for me to get all the helpful tips that Jen will provide. I have never actually sewn along during a sew along, but it’s kind of fun to do it like an actual class and not skip ahead. But after my Archer homework, which isn’t much at one time, I still have other things I’m doing. So for all these reasons and probably more, I’m giving this juggling act a go. We’ll see if it’s successful or if I crash and burn. The measure of success? Whether or not I actually complete the works-in-progress. You know, the creating part of creativity. So far, I like that I seem to be going to my studio more often, rather than just when I have hours to spend there. It seems more balanced and manageable somehow; I know there’s a little something I can do on one of my projects that won’t take long. Hopefully it will be sustainable! Whether or not you like to spread your energies over multiple projects simultaneously, here’s a favorite tip I’ve adopted from Tasia (Sewaholic). These pant hangers from Ikea are 99¢ each, and they are an absolutely brilliant way to keep your in-progress or TNT patterns out of the way and uncreased! PS: The sleeping beauty photo up there isn’t mine. Click here for source (Health magazine). I am a dip my toes in many things person. 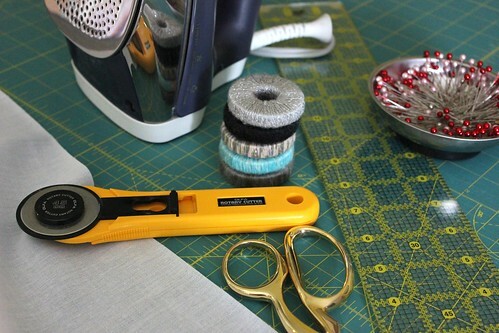 Sometimes I will cut several things at once at the cutting table (read dining table) and then stack them in the sewing room and sometimes I just get excited about something else half way through a problem – I guess I have commitment problems. Love the hanger tip. That should read half way through a project – must be a Freudian slip. hahahaha you are so funny BeaJay! oh i am just like you!!! i take forever to cut, and i really hate fusing. i’m also way too impatient for a sew along (i cut, sewed, and finished my archer the weekend before the sew along was supposed to start… oops). i like the idea of beng able to juggle more than one project, but i seem to be incapable of actually dong that! the exception would be knits. i do like to cut a few tees at once, especially if i already know my pattern fits. Nice post! I always think it’s so interesting to learn about others’ creative processes. I’m not sure which I lean towards more… I guess if you count planning and designing phases then I definitely have several things going on at once. :) sometimes I have too many I don’t know which one to start! Yay for the archer! I still need to trace my pieces… Sigh soon! Ah well, at least you have it all put together! :) Looking forward to seeing your version(s)! I largely only sew one project at a time, but I do definitely trace and alter several patterns ahead of time. I feel like the tracing/altering is my big hurdle, so if I can get that done the project can move forward more quickly when I’m ready. 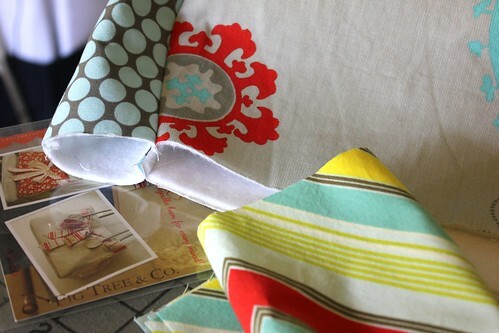 I occasionally will cut several projects, if I’m in that particular zone rather than sitting and sewing. I am currently cutting/sewing rugby jerseys for my hubby and sons at the same time, so I can take advantage of the same thread colours and repeat the same steps at the same time rather than doing each one all the way through individually. I’ve always been a one-project-woman, but have recently found myself flitting between a couple of projects and have found myself to be much more productive. Very odd! I love the hanger idea…totally stolen. Steal away — you’ll love it! I am a total convert. I’m so excited to see your archer! I want to make one but i’m sooooo scared. When I first started sewing, I always only worked on one project at a time. Now, its a bit of a total mess. I have quite a few of those “I don’t want to do this next step” projects, some a few years old. What happens to me is end up pulling them back out for some reason, I am looking for something else or I am reorganizing, and usually I am surprised that now it looks easier to finish somehow…maybe it’s more experience or a different perspective. I say juggle away Susan, and enjoy the process. 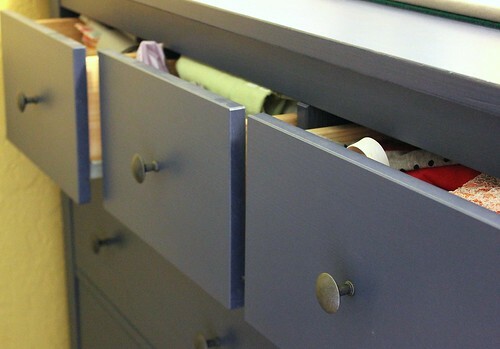 Leave the not-so-fun project aside and tackle it when you’re ready! Absolutely, Judith! I think at this rate I may actually try everything and finish nothing!